If you watched BBC Question Time on Thursday November 9th 2017 you will have seen a Tory plant in the audience bridling with faux outrage at the accusation that the Tory government is responsible for the mistreatment of disabled people. Here's a clip of the encounter. The audience member in question is the Tory councillor for Horley Central in Surrey, although he used to be a Ukipper until he saw the political tide turning and opportunistically jumped ship to join the Tories. The Ukipper-turned-Tory (blue-kip) councillor furiously condemned Aditya Chakrabortty as "the Donald Trump of the left" for daring to highlight the Tory track record of mistreating disabled people. Given that the Tory plant in the audience was basically trying to deny the appalling Tory track record of mistreating sick and disabled people as "inflammatory rubbish", it's obvious that he's actually the one using reality-denying Trump-style rhetoric to render uncomfortable truths as "fake news". But by now we should all be well aware that accusing your opponents of what you're guilty of yourself has always been one of the classic right-wing propaganda tactics. Here's a list of issues that the Blue-kip plant in the BBC audience was trying to publicly deny. The Tory government's own figures admit that thousands of disabled people have died within six weeks of being declared "fit for work" and stripped of their disability benefits by the Work Capacity Assessment (WCA) regime. The Tory government desperately tried to hide these figures by refusing to comply with Freedom of Information requests. The WCA regime was declared unlawful for the way it discriminates against people with mental health conditions, but the Tory government carried on regardless. Appeals against botched WCA rulings have been costing £50 million a year. The Tory government have ensured that this cost is paid for by the taxpayer, not the profiteering corporations that made the botched assessments in the first place. The WCA disability denial regime costs way more in corporate outsourcing contracts to administer than it will ever save in reduced disability benefit payments, meaning the Tories are forcing the taxpayer to subsidise their systematic abuse of disabled people. An incredible 420,000 disabled people were hit by the Tory "Bedroom Tax", many of them for "spare" rooms used for medical equipment, or for carers to sleep in. The financial stress caused Stephanie Bottrill to commit suicide leaving a note blaming David Cameron and the Tory government. Tens of thousands of disabled people were forced onto the Tories' shambolic Work Programme, but the outsourcing companies running this scheme knew they could never make a profit from helping "difficult to place" clients, so disabled people were just "parked" while the corporate parasites focused on cashing in on easy to place clients. Just 8% of disabled people to be put through the Work Programme end up finding jobs! A United Nations investigation into the treatment of disabled people in the UK found that the UK government was committing "grave and systematic violations" of disabled people's rights. In March 2016 309 Tory MPs voted to cut the Employment and Support Allowance by £1,500 per year. Not a single politician from any other party voted in favour of these cuts. As a result of this brazen economic assault on disabled people, several Tory MPs were sacked as patrons of disability charities. The Tory party claimed to be scrapping the Disability Living Allowance (DLA) and replacing it with Personal Independence Payments (PIP) in order to make sure the money went to the right people, but in April 2017 they slashed PIP payments by 33% using the perverse excuse that this would incentivise them to find work (despite there being no evidence whatever to back up this claim). Disabled people undergoing PIP assessments have routinely been asked "why haven't you killed yourself yet?" by their assessors. An incredible 65% of PIP decisions that go to appeal are overturned, yet the profiteering outsourcing corporations making these botched assessments (Atos and Capita) just had their contracts extended by two years by a no-bid process! The Tory party constantly claim that the purpose of their disability cuts is trying to get disabled people into work, but they deliberately laid off 1,500 disabled people by shutting down Remploy factories, many of whom are still out of work years later. Despite constantly going on about the importance of helping people with mental illnesses, the Tories have been doing precisely to opposite; slashing funding for mental health services and actively instructing it's corporate army of disability assessors to discriminate against people with mental health conditions. Since 2010 the Tories have had seven different disability ministers in seven years, with most of them using the position as nothing more than a stepping stone to higher positions in government, rather than doing anything to actually help disabled people. The latest Tory disability minister Sarah Newton has a shocking track record of voting against the interests of disabled people. The Tory government are confiscating an astounding 900 adapted motability vehicles from disabled people per week. In one case they confiscated the motability vehicle to save £6,000 and then agreed to pay £65,000 in taxi fares so that the disabled person could continue going to work! The mainstream media has given this disgusting Tory track record only a tiny fraction of the attention it deserves, so people can be forgiven for not knowing all of it. However, you would have to have spent the last seven years living in a lead box to not be aware of any of this stuff. 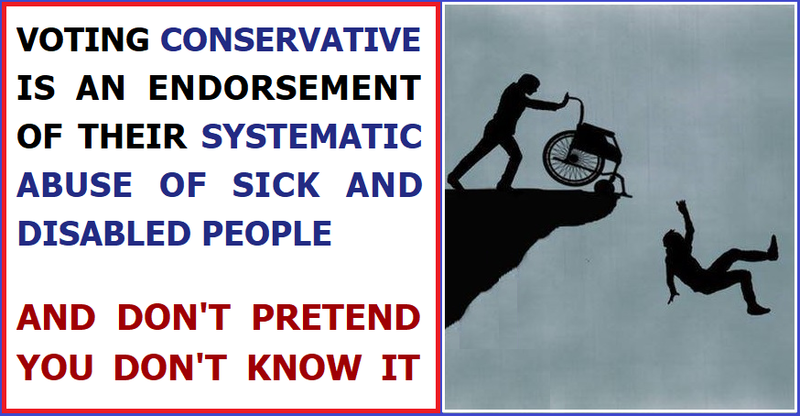 The fact is that when it comes to election time, Conservative voters are aware that the most vulnerable people in society suffer under Tory rule, but in the grim amoral calculus they perform in their minds, the suffering, destitution and actual deaths of disabled people are somehow a price worth paying for whatever (probably imaginary) benefit they think they'd be getting by electing a Tory government. Of course the majority of the blame is shouldered by the Tory politicians who voted in favour of these horrifying policies, and cynically used the role of Disability Minister as a temporary stepping stone to other things instead of trying to actually help disabled people, but Tory voters are not exempt from blame because by endorsing the Tory party, they're complicit in allowing this disgraceful systematic abuse of disabled people to continue. It doesn't matter how much blustering faux outrage and denials of reality people like Chris Stevens utter, the fact is simple: People who vote Tory are guilty of voting in favour of more suffering for sick and disabled people.